Below you'll find the second episode of It wouldn't happen in Swansea..., the podcast for Swans fans, by Swans fans! This episode contains a discussion of Swansea's game against Nottingham Forest, the question of who should be dropped now Monk is back, a profile of an ex-Swan, Matt's weekly rant, some non-Swans related stories and, of course, Challenge Matt! As always your feedback and comments are very much appreciated, we are still pretty new to this and a little rough around the edges, but can only get better (hopefully)! Thanks to everybody who has contributed with questions and comments! Despite Italy being unable to pick up back-to-back Six Nations wins, today was a still a great day to be an Italian sports fan, thanks to Fabio Borini who put in the performance every Swans fan has been craving from a striker for so, so long! Fast, skilful and goal-capable. He promised goals and delivered! A breath of fresh air. Now I could go on and make comparisons between him and Luke Moore, who has put in some good performances recently, but I'm leaving that topic for now. Feel free to make your own comparisons. It was by no means a solo performance though. Scott Sinclair and Nathan Dyer tore through Forest's defence, though Dyer can be frustrating when he does 95% of the work, but consistently misses his shots. Thankfully though, Swansea don't need Dyer to do the scoring – that's for Dobbie, Sinclair and, now, Borini, to do! The attack was brilliant and at times so was the defence, but this could've been a totally different blog had Forest's stoppage time strike hit the back of the net instead of the post! In the first half, when the score was 2-0, I had visions of a 5-0 scoreline at full time – it seemed like it could be Leeds all over again, only better! However, as all of you who read this will be aware, Swansea don't always like to make things easy on themselves, and gave an easy goal away as Williams let Boyd turn in the box. After the interval, Borini scored his second and Swansea's third and it seemed like there was no way back for Forest. Then a goal in the 92nd minute gave Forest a new hope that an away point was still in reach. Suddenly Swansea were on the back-foot in momentum and had two minutes to cling onto their lead! How things changed from a certain win to a shaky last-gasp ending. When McGoldrick's header hit the post in the 93rd minute I think 18,000 hearts stopped! Thankfully Swansea won 3-2 and, ultimately, deserved it. It's three points that sees them keep their 3rd place spot in the Championship. Elsewhere it was great to see Garry Monk back on the field, he will be needed in the next few weeks as the Swans look to push themselves back into top tier football! NEW PODCAST! - "It wouldn't happen in Swansea..."
As promised for the last few weeks, you can now listen to the new podcast: "It wouldn't happen in Swansea..." by Chris Carra and Matt Barroccu. The name may seem a little irrelevant at the moment, but it will make much more sense in the next few podcasts. This first (pilot, if you like) podcast is mainly to test what you all think of us! We have a few sections where we discuss the game against Derby, whether Ashley Williams was wrong to have a go at fans, and the highly anticipated (well... by me) "Challenge Matt", where we see how much of a Swans expert Matt really is. There is also a little off-topic rant about people at the theatre towards the end. Listen to the whole thing to get the full impact of what we are trying to achieve! Then give me a comment, either below or on Twitter to let me know what you think! If you love it, tell us. Equally, if you hate it, tell us (but make sure it's constructive so we can improve next time). We know it's not perfect due to limited time in the studio (and the fact that we are generally inarticulate slobs), but next time we will have more flexibility, and can record some of the features you sent in! As always thanks for reading and, more importantly, enjoy! You may look at this and quickly think "hey, this isn't a blog post - I've been cheated! ", but you've jumped to conclusions too soon my friends. 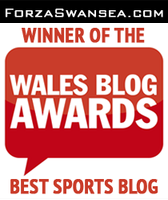 Check out this link, where you will find a new blog post I wrote for thefootyblog.net, all about the Swans! As always all your comments are welcomed! On a pitch that looked very unplayable, it was the poorer side that got the luck. I guess, like many Swans fans have admitted, Alan Tate was due to give away a penalty after a couple of recent lucky escapes. Things even themselves out I guess! Definitely a blow to their confidence, but not to their promotion hopes. Many are talking about “bouncbackability” but I don't feel the Swans really need to “bounce back”. It's not like they have had a torrid run and need a big swing in luck to win tomorrow; it was just our old friend 'the blip'. I'm going to be careful here because whenever I say “I can't see the Swans walking away with less than three points”, I almost certainly get it wrong! But, as discussed, the Scunthorpe game was played on a poor pitch and away, so getting back to a beautifully kept Liberty Stadium, in front of a home crowd, the Swans will certainly be favourites to win the game against Watford. Currently 12th in the Championship, The Hornets current form isn't spectacular. Though they beat Millwall on the weekend, they lost / drew the last five before that. Now being 12th in the table isn't much for them to get excited about, but in this very close league a win would take them to 53 points which is where Burnley are now, in 7th. With 12 games left to play, there is still plenty time for Watford to climb into the play-off places, so they will not want to lose this. I expect a low scoring game, with Watford defending as much as possible. Then again, last time these two met was a thrilling (for all the wrong reasons) game (my report is worth reading again! ), with the Swans claiming a 3-2 victory after almost gifting Watford a draw. However, Swansea have developed so much as a team since then, a repeat is unlikely. If you have been following my predictions... sorry. I haven't been extremely reliable in the last few games have I? As I said, a low scoring game is what I am expecting so maybe a “under 2.5 goals” bet is worth while. Score? I am going for 1-0 to the Swans, with Moore or Sinclair to get the winner. Firstly, thanks to those who contributed to the podcast idea. Despite some complications resulting in the podcast having to come offline, a new one will be up soon! Definitely stay tuned. Tomorrow we'll see Swansea on stage up in the sunny Scunthorpe! Like the majority of supporters (and non-supporters alike), I think I am not too forward in saying “I can't see Swansea losing”. They're in great form, great spirit and a great table position, so if we can't be confident now, when can we be? Brendan Rodgers has made manager of the month, a superb achievement. It's a feat I can't even achieve in FIFA 11's Manager Mode, so to win it for real just shows how far he has come in his short time with the Swans! With such a confident squad and manager, it is impossible for Swansea to lose tomorrow. But I've said this before and have been very wrong! We know all too well that the Swans can shoot themselves in the foot eleven times over by going into a match looking too far ahead of the game in front of them. Scunthorpe is another must win game and it'll be no good imagining the Premier League if they can't beat a poor Scunthorpe side. These days even a draw isn't that reassuring in an ever changing top 6 of the table. In fact a loss tomorrow could see Swansea, theoretically at least, drop back down to fourth (this is a worst case scenario by the way). A win though, would keep them in the automatic promotion spot, where they, lets face it, deserve to be. I seem to have started offering betting tips in my blogs recently, which is odd considering I am usually way off! But I'm predicting a 2-0 victory to the Swans. I know its an away game and who knows, Scunthorpe may well grab a home goal for the fans to cheer at, but they are struggling in 22nd at the moment and have lost more Championship matches than any other club (20) and failed to score in the most (16) (thanks to the BBC for those wonderful stats!). But who will score? Well thankfully many are sticking their hand up for the Swans and even Luke Moore now has two goals. I'd say Moore, Sinclair and Dobbie all have another goal in them this match, though with Dyer and Pratley around and with Williams capable of getting decent contact on the ball from corners, a “first goalscorer bet” may be a bit pointless – it's hard to predict these days! I'm actually in Rugby tomorrow (the place, not at the rugby, like I've had to explain to my dad twenty times this week), which is closer to Scunthorpe than Swansea, but I'm unable to travel further to make the game. I'll be checking in on my numerous iPhone apps to see how the Swans are playing minute-by-minute, though I have no major worries that all three points will be coming home with them.